Healthiest pulao I would say. Lots of proteins and vitamins. No grinding and not much of stress to prepare this dish just 15 to 20 mins is enough. Anyone can cook, bachelors too Soya chunks is easily available in Indian store and other marketplace. The Soya chunks added to the rice makes the pulao more delicious. I too use soya nuggets in pulao or curry from time to time...Yummy dish!! 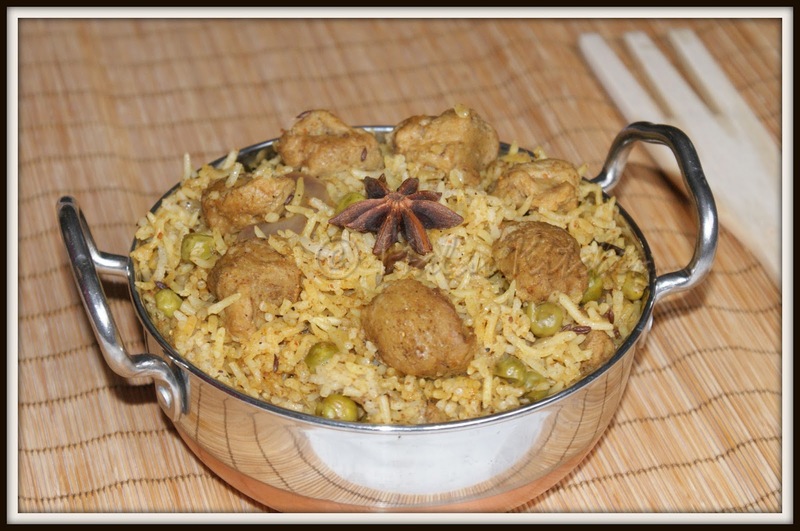 My all time favourite, truly tempting..
i just love soy chunks in pulao..looks deliicous.. Surely healthy one. A nutritious dish especially for vegetarians. My husband loves soya chunks and keeps adding it to every dish he cooks. We cannot take these soya chunks. Donno why! ?